After the moist weather, my spinach developed yellow spots on the upper foliage which broke open on the underside revealing white spots. 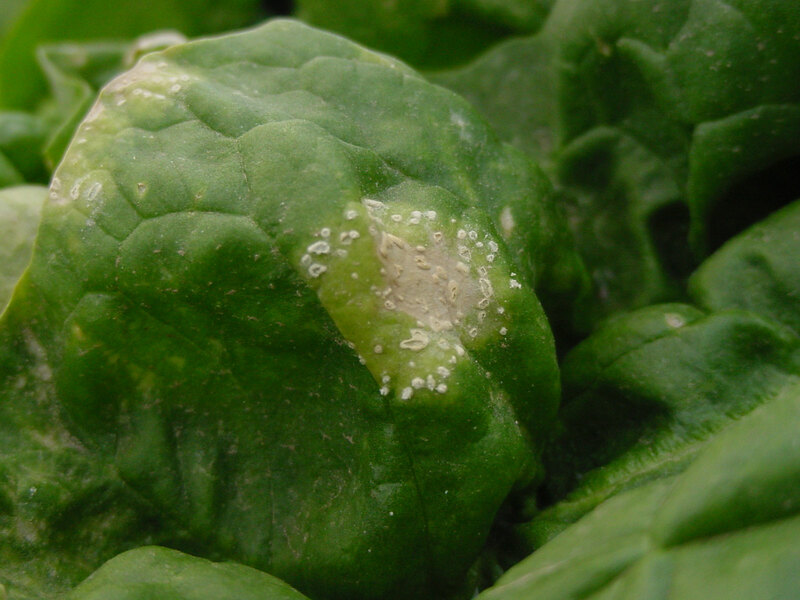 This is white rust, a serious problem on spinach, caused by the water mold Albugo occidentalis. Entire leaves can develop symptoms. The disease is favored by cool temperatures, dew, intermittent rain, and overhead irrigation. 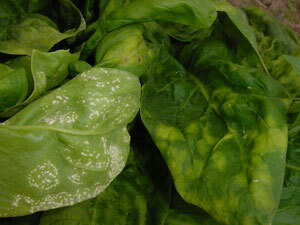 Once the disease is observed in a planting of spinach, the affected leaves should be stripped from the plant so they will not serve as a source of secondary infection. Sidedress with a cupful (one pound) of a 50 percent slow release fertilizer such as 19-5-9 per 100 square feet of planting area to stimulate new growth. White rusts caused by other Albugo species occur on turnips, radishes, rutabagas and mustard, as well as four-o’clocks, morningglory, and certain local weeds. 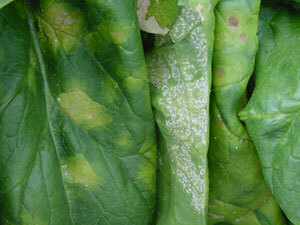 White rust was once the major disease of spinach in Texas but commercial growers now maintain excellent control. This organism has two ways to disperse: oospores are long-lived and move passively in soil; sporangia are short-lived and windblown. White, blister-like pustules form first on the lower leaf surface and open to release windblown reproductive structures (sporangia). Initially, the upper surface will only have yellow (chlorotic) spots but in advanced stages, the hite lesions also form on the upper leaf surface. Plants infected with white rust are weak and stunted collapse quickly if environmental conditions are favorable for further disease development. Late in the growing season, resting spores (oospores) form in sick leaves on abandoned plants. Oospores released into the soil from decomposing diseased leaves have limited energy reserves but can linger a year or two until the next spinach is planted. However, this dormancy can only hold out indefinitely, and Texas farmers have learned to rotate with other crops for 2 years to starve this water mold. Initial outbreaks each season follow source weather events such as hard rains that deposit soil and oospores (pathogen “seed”) on the young plants. Free moisture on the leaf surface must be present for spore germination and development. The optimum temperature for germination is 54 degrees F. The disease develops most rapidly at 72 degrees F. or during periods of cool, humid nights and mild day temperatures. Several varieties have very useful partial resistance, including ‘Ashley.’ The Monstrueux de Viroflay spinach named heirloom “monster” spinach has NO RESISTANCE WHATSOEVER to white rust. Rotate with other plants for two full growing seasons between spinach crops. Irrigate with drip irrigation to minimize leaf wetness events and duration. If favorable environmental conditions occur and you have a history of this disease, begin a disease control program with protective sprays such as Neem oil and Kocide (beginning 30-45 days after planting and at intervals explained in pesticide label instructions). 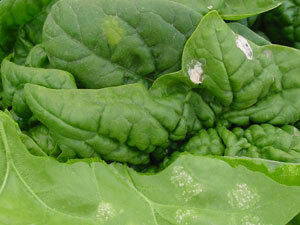 Spinach fungicides for White rust and/or Blue mold disease control. FRAC = Fungicide Resistance Action Committee, http://ipm.ifas.ufl.edu/resources/success_stories/T&PGuide/pdfs/Appendices/Appendix6-FRAC.pdf Misuse of Groups 4, 11, and others may lead to fungicide tolerant pathogens.